I am at the final stages of sending my Osmond Tour book to print today. It has been long in development and even longer in the final editing/changes/publishing stages. It’s almost there, now down to just getting final printing arranged and getting delivered to the online stores that will be fulfilling it. Through this process it has been very difficult to pick out which photos “make the cut” to the final pages of the book. In my previous publication, it was just one entertainer, so it was much easier to just look for various great shots of him. In this go around, there are 7 entertainers to try and fairly represent throughout the book; a much bigger task than I had previously anticipated. Today’s image is one of the shots from the tour that I really like that just didn’t make the cut. I already had too many shots of Donny, and too many from the back of the stage. 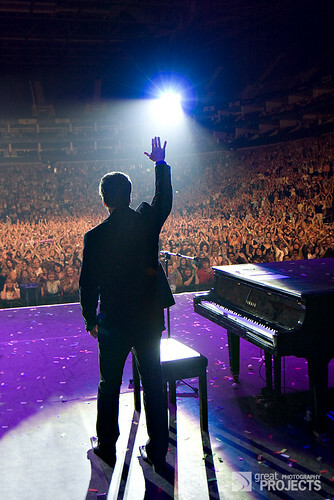 Though this was a poignant moment at the last concert in the UK, it also showed only Donny when the tour was about the entire family and not just him. Again, a tough decision, but in the editing process it hit the digital cutting room floor. Perhaps someday I can publish a “photographer’s cut” kind of selection of my favorite shots taken over time and can include many shots that appealed to me as a photographer more than what needed to be included in a current publication. Bridal shoot this last weekend. It was a rough one, with rain threatening the entire time and light quickly fading. We had a tight window of time, but we made it work. I was reminded that reflectors double as quick umbrellas for the bride when it starts sprinkling! We wanted a series of shots with her veil “blowing” in the wind. Since no wind was found, her friend would hold it up high, and on que, release and back out of the frame. I had some wide shots it worked really well in, but I liked this closeup as well. 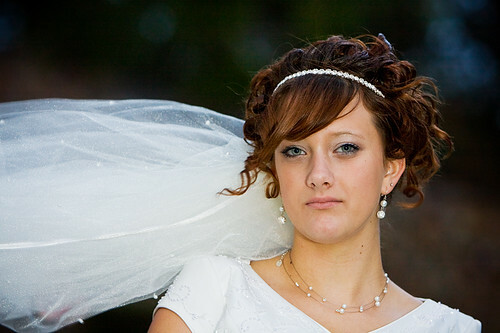 Often I like to portray the happy bride, obviously, but this bride liked a more solemn look. I had to remind her several times to give me some versions of various poses with a smile as well. With a couple of hundred frames taken in the 35 mins we had, she will have some good choices! This shot is one of my favorites from the recent sessions, of Autumn and her daughter London. London is only a month old, and therefore was having a tough time keeping interested in posing for the camera. Autumn was holding her and letting her have the “binkie” for a bit to sooth London and hopefully get a few more minutes of camera time. These are some of the moments I wait for, the candid interactions between a mother and baby. When you ask for a pose, you tend to get something that looks just like that, a contrived pose. When they do what comes naturally, a mother’s love shows through. 3 Delicacy 180 strobes, 1 shoot through umbrella camera left, one soft box above camera, 1 with grid on boom as hair light. Yesterday morning I stopped by the lake front scouting out a location for a family shoot later that day. I have been taking a little time off of photography for the last few weeks, looking for a rejuvenation of my creative thoughts after a brief hiatus. So, if you didn’t catch it, there is a little double meaning in the “reflection” part of this image title. I have to admit, getting out for a few minutes on a brisk morning was reinvigorating. I was reminded how much I love getting outside with a camera in hand, looking for things that catch my eye. I have a number of shots I have taken recently and will process some to put online. Stitched Panorama using 8 images. Note that the smoke column is actually steam on a cold morning coming from a power plant. Not exactly a great inclusion in a nature shot, but I thought it was a good representation of how there is still beauty in nature to be found even a short distance from where we live and work. As with any panoramic, this is much better viewed large. This last weekend I had the opportunity to join the Photowalking Utah group out on Antelope Island for the annual Bison Roundup. Though the actual roundup took place earlier in the week, this was an opportunity to get up close to these amazing animals while being checked, sorted and vetted. My wife and two of my kids made the early morning trek from where we live, which is about an hour and a half drive, the morning after Halloween I might add! Though there were some that went up early for the sunrise, we decided the 9:30 meeting time was early enough for us. 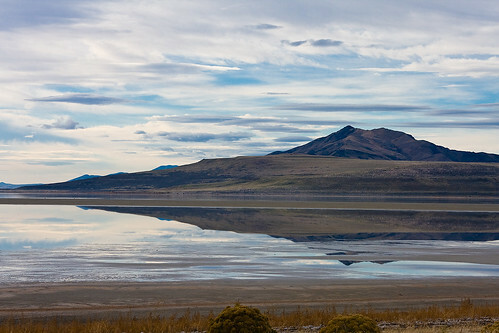 If you have never been to Antelope Island, it is located West of Syracuse, Utah, connected to the “mainland” by a causeway. We met at the State Park gates to allow for some carpooling to save on the entrande fee. While driving on the causeway, I noticed the scene you see above and had to stop the car for a quick few photos. I could have spent a lot of time getting more of these scenes, but I wanted to get up to the corral. Once up at the right location, our caravan of cars was squeezed into the available parking and we gathered for an early group shot. Getting the group shot right off the bat seems like a wise choice considering last time we only had a small portion of the group represented when we tried to take the shot at the end. Scott Smith, the organizer of this photowalk took the shot and has posted it on flickr. The enclosure for the bison as they were run through their tests and sorted had only a small number of viewing points, so everyone had to take turns looking for their shots. Photowalks are a funny thing for me, depending on my mood I may spend more time with the actual subject we are there for, and other times either just socialize or take photos of other things. This time around I took a variety of bison shots, but ended up shooting more photos of the photowalkers in action. I came back with a fun set of photos and having had a great time with friends. You can view my flickr set from the outing to see more of what I ended up taking and posting. Also, check out the flickr pool of what everyone has posted to seem some great photos. The next outing is a ladies walk, so I’ll pass on that 🙂 December will likely have a couple of events, so keep tabs on announcements on the PhotwalkingUtah.com site.